So you just finished your first PCB in Eagle. Good job. Me too actually, and after a few days I came across something very cool. Eagle3D. 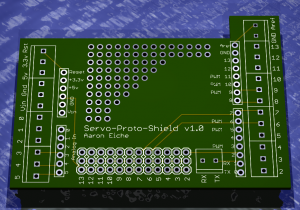 Eagle3D takes your Eagle .brd file and renders it as a 3D image, so you get to see the board in a photorealstic way. (I think I’ve been saving up photorealistic to use in a post-1995 context. I really don’t think I’ve seen it used to describe anything since the box of Myst). So you download Eagle3D, you download POVray, you copy your include files over there, generate your .pov file, and you launch POVray in anticipation… and then it crashes. MegaPOV is a derivative of POVray, and it’s fortunately written in Cocoa and is a proper universal binary. Because it will run properly, we can use it to render the images Eagle3D turns out. MegaPOV is an easy click-and-drag to install. Just stick it in your Applications folder. For Eagle 3D, I recommend you move the folder into the EAGLE folder in your Applications directory. Good place to have it. 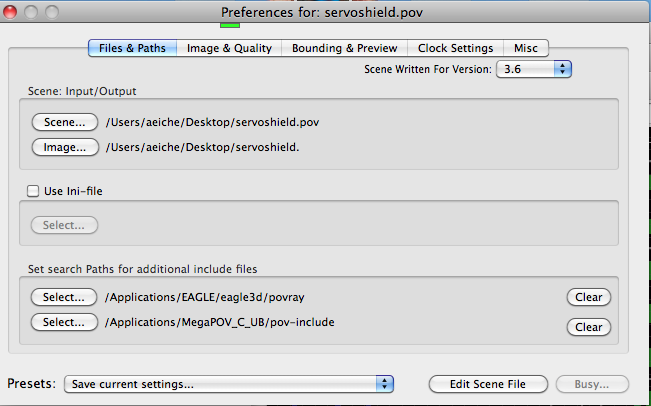 In order to use MegaPOV for Eagle3D, we need to copy some include files from POVray . In the POVray folder, you’ll see a folder called includes. Rename this folder to “pov-includes” (or whatever you would like), and copy the folder into the MegaPOV folder. It’s relatively easy to fix this. The variable named environment is the culprit, and we’ll need to change it in the ulp file in the Eagle 3D folder. As Eagle3D is a few years old, everyone is probably using the 3d41.ulp. If you’re not, you’ll need to change the file you’re using. That’s it, no other changes to be made in the code. You just need to capitalize the E in “Environment”! That’s all you need to do. From this point, you need to simply run the Eagle3D script in EAGLE, and it’ll generate your .pov. Open your .pov in MegaPOV, and it should render just fine. Doesn’t that ruin the surprise of how your board will end up looking? Hmm… I hadn’t really thought of it in terms of a “surprise”. But you’re right, where’s the excitement? On the other hand, I think it may help in terms of visually troubleshooting something. Footprints, placement, etc. In theory you shouldn’t run into these problems with proper schematics and layouts, but I like being able to see the (supposed) final product. Nice tutorial and great work. The final image is very nice, its good because you can use the 3D in presentations, to show your boss. 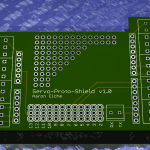 there seems to be an error when i try to render my eagle pcb. Parse Error: Cannot open font file. I’m not deeply familiar with the inner workings of MegaPOV and POVRay, but from what I’ve searched, this appears to be an issue with Povray not being able open the font file -specifically that the file is most likely not a .ttf format, so povray doesn’t know how to read it. See if you can change the font and get it to work. That’s what I figure is the problem. Best of luck, let me know how you fare. 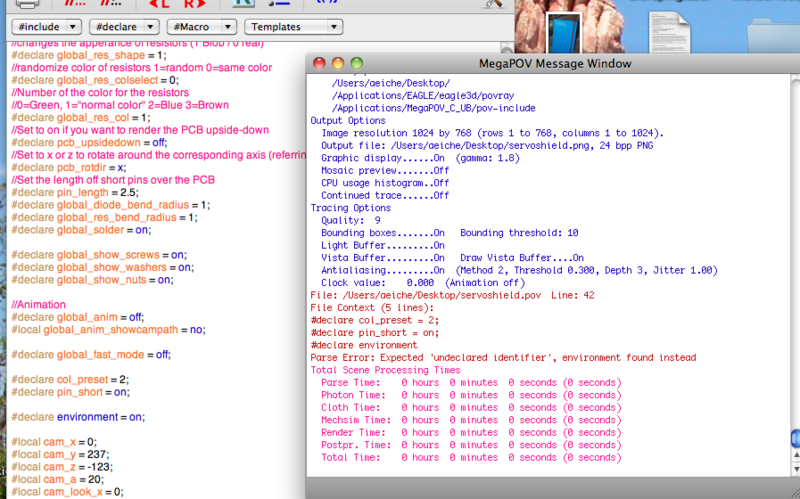 i just copied a missing font into the pov-include file. by the way how can i make rotative animations? I don’t know if there’s a way to make animations with the eagle3d plugin. I’d do an internet search to see if something like that is available. If not, at the very least you’ll have the povray script for the board. From there you should be able to create an animation with povray or megaPOV. I have the same problem that you had. which font did you copy in which pov-include file? Thanks for the great post. I was able to get it working once I followed the advice that martin gave to copy the missing font into the pov-include folder. 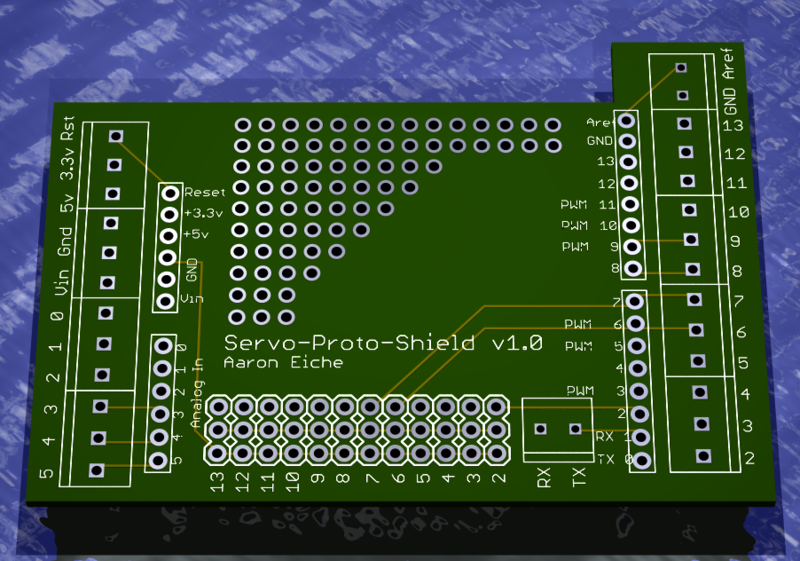 My Eagle board design rendered out in 3D quite well. I’m glad it was helpful – It can be a real irritation trying to figure it all out. Care to share a picture? Cannot seem to get this to work, not sure if Im missing something. Everytime I render a PCB all I get is an X Y Z gridwork grid. This is the message I get. Image resolution 320 by 240 (rows 1 to 240, columns 1 to 320). I don’t think MegaPov isn’t smart enough to go looking outside it’s own directories for fonts. You might try finding a copy of this font and sticking it in the path listed and see if that helps. Sadly POVRay is a bit of a finicky beast. Best of luck. Sorry to ask again, when you say find the file and stick it in the path, could you please expand on that. 1. where do I find it 2. which path do I stick it in. So the error that it’s providing is saying that the font file (presumably that it’s relying upon to produce the render of the board) isn’t in a directory that it’s looking at. So we need to either get that file (the font file) into a directory that it’s looking at, or we need to set the directory it’s looking at to one where the font file is. I’m inclined to the do the prior because I don’t want POVRay set to look in a directory for a single file. If you don’t have courbd.ttf (which I just learned from our search is Courier New Bold), you can download a copy. If you *do* have it, search your Mac and find the file, and drag a copy into that include path we found above. Got to be an idoit as I have no idea how to do this. This should tell you something about where MegaPOV/POVray is looking for the font file. //Check the availability of the fall back font. If not available throw an error. Aaron, thanks for you help. I followed all you download instructions. What I cant understand is this. If I followed you instructions to the letter which I did three times, why am I getting errors in the first place. By the way Im not blaming you I just dont understand. Everytime I fix one error I get another in the end after fixing 15 errors I just gave up and deleted megapov and povray and eagle 3d to much effort to get it working. Hi Paul, I’m sorry you didn’t have success getting it to work. The instructions I offer here may not work for a variety of reasons. 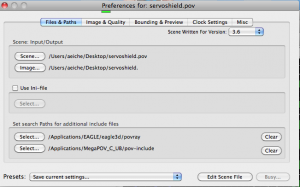 This post is two and half years old – I’m not sure is MegaPOV or Eagle3D haven’t been updated or changed, or quite possibly if something has changed in OS X that causes different issues. I found this particular solution over the course of a few hours trying to understand what the errors were and how they might be solved. Again, sorry it didn’t work for you. If you do find a solution to your particular problem, I’d love to know what you find. I thought Id get in touch managed to solve the problem took a lot of work. But my issue seems to be a lot of missing files that need to be in the ULP file of eagle 3d. I had to put in all the files ending in inc. I had to download all the required fonts and also put those into the ULP file. Once I did this it rendered perflectly. Except one thing which Im hoping someone can help with. I used a WIMA capacitor for what should of been an ELKO and I understand you can go ing toe render file and change it but I can not for the life of me figure out what im suppose to put in. The capacitor I need is listed under the 3d model as.